Did you find a brand that would make a perfect fit for your business? Awesome! TERMS & CONDITIONS: First, be sure to read our Terms & Conditions of The Brand Bar. INQUIRE TO PURCHASE: Click “inquire to purchase this brand” button on the brand details page. You will be taken to our inquire to purchase form. Please fill out this page in its entirety and make sure to note any custom fitting in detail here. Note that filling out this form does not confirm your purchase. COMPLETE FULL PAYMENT: If your inquiry to purchase is accepted, you will contact bySalted Ink via email within 24 hours (excluding weekends) and sent an invoice for the listing amount total. Once this invoice is completed, we will mark this brand item as “SOLD” to take it off the market as we begin your customization process as each brand listing is only sold once. Please note that this invoice is final and non-refundable. CUSTOM FITTING (proofing + revisions): Once the first payment is received, A Thousand Faces will prepare all of your brand file proofs for you with your customizations in place to make the brand perfectly fit your business. If needed, you may request one round of edits after the proofs are received at no additional cost. Any further edits will be billed at A Thousand Face’s hourly rate. Please refer to “custom fitting” in our Brand Bar Terms & Conditions for further information. FINAL FILES: Once all final files are approved by you, we will prepare all files for your use in all popular file formats including vectorized artwork and upload them to our Dropbox folder. You will download all of your final brand files via the Dropbox link sent to you via email and start using your new brand immediately! Please note: We will set up your print files with bleeds in PDF format if you know what your printer requires. Otherwise, we will give you the .ai (original vector design files in Adobe Illustrator) format for all of your print material so you/your printer or anyone with the proper design programs can adjust accordingly. The Dropbox link will be available for 7 days so please be sure to download all files and keep a backup as well. A Thousand Faces is not responsible for maintaining copies of brand files after the project is complete. TURNAROUND TIME: The proof and final file turn around time depends on the particular logo format (custom handwritten takes a bit longer than font) as well as if any revisions are requested. However, we strive to have all final files to you in less than 10 business days after the first payment is completed. 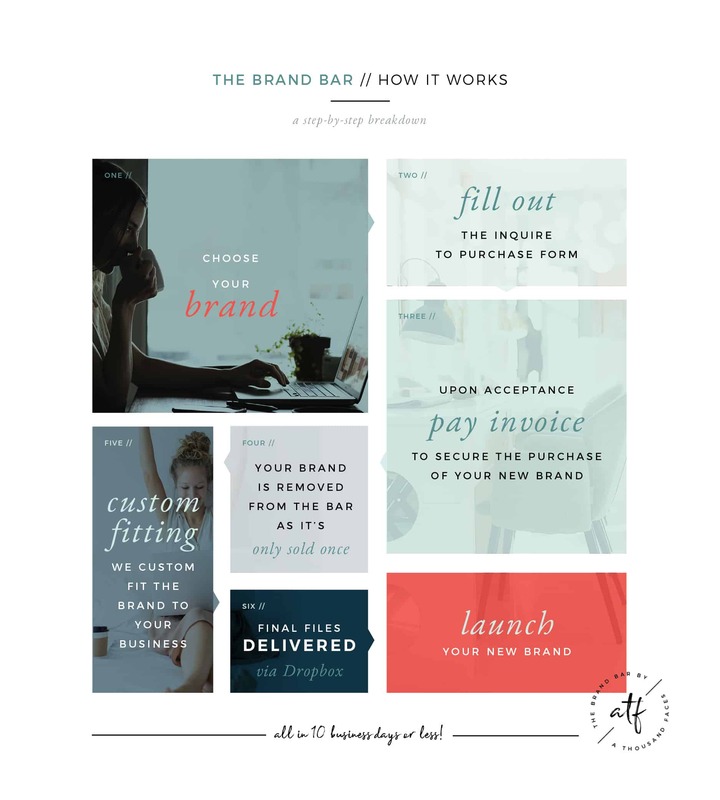 As a client of the Brand Bar, you are required to complete your feedback in a timely manner. If your project goes past 30 days from purchase without a response from you, we will re-list the brand and you will not receive your final files.